I'm kindof toggling between both, as evidenced by this confession and this celebration. Just know that we're all in this together... and we're all doing the best we can. The best news is: you don't have to be perfect. or Pinterest-y. You're enough. You're loved... and you have so much to offer the world (and your family). 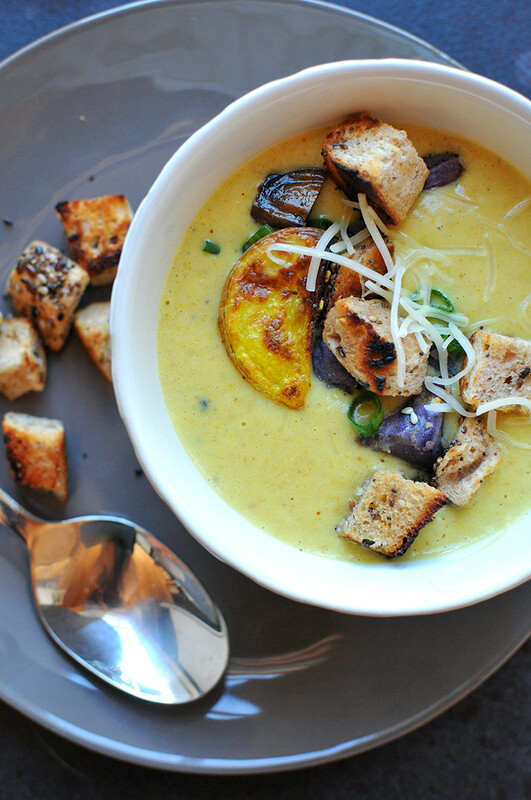 I consider this soup a total "win-win" --- for both mom and the kiddos: colorful, nourishing, and DELISH! Just like with smoothie bowls and overnight oats, the toppings are what take this soup to next level awesome!! The creamy cauliflower potato soup is topped with toasted everything bagel cubes, a few extra (diced) roasted potatoes, more cheese, and a sprinkle of green onions (optional)... for added flavor and texture. 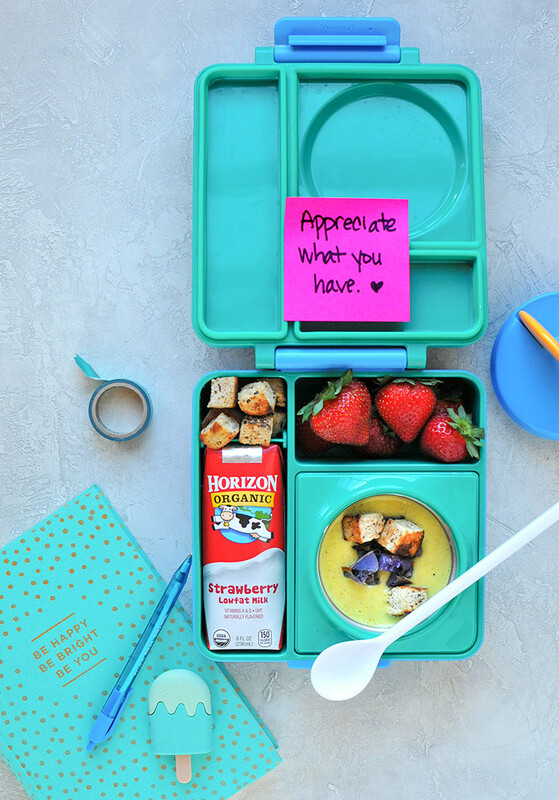 The soup stays hot a solid 4 hours in these adorable OmieBox lunchboxes. And it's perfect paired with bagel cubes, strawberries, and milk. The adorable handwritten note is optional, but highly recommended! * the medley I buy has 4 purple potatoes, 4 yukon gold (yellow), and 4 red. Slice the potatoes into wedges and lay them in a single layer by color (separating the purple ones). Break the cauliflower into small pieces with your hand, or cut with a knife. Also lay out in a single layer. Brush on the olive oil, then sprinkle everything-but-the-bagel spice on both the potatoes and cauliflower. Sprinkle the turmeric just on the cauliflower. Bake for 25 - 30 minutes until potatoes are golden brown on the edges and the cauiflower is softened. Meanwhile, on the stovetop in a medium pan over medium heat, saute the everything bagel cubes in butter for approximately 8 minutes, stirring frequently. Bagel pieces should get browned and crispy, but not burned. Set aside. Once the veggies are done roasting, remove them from the oven. 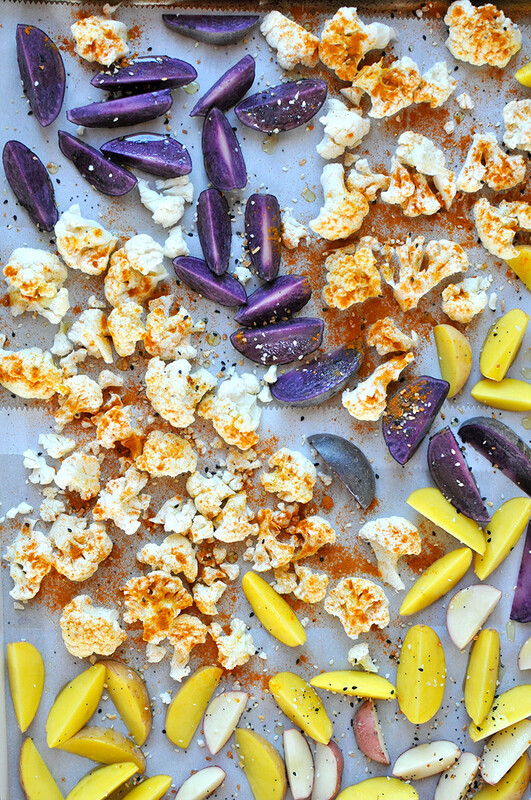 Keep the purple potatoes on the baking sheet, but transfer the yellow and red ones into a high speed blender. Also add the cauliflower and milk and chicken stock. Using the soup functionality on your blender (or high for about 45 - 60 sec), blend until smooth. Pour soup into a large stockpot over medium heat. Stir in sea salt and the additional everything spice, plus the cheese. Stir until melted. 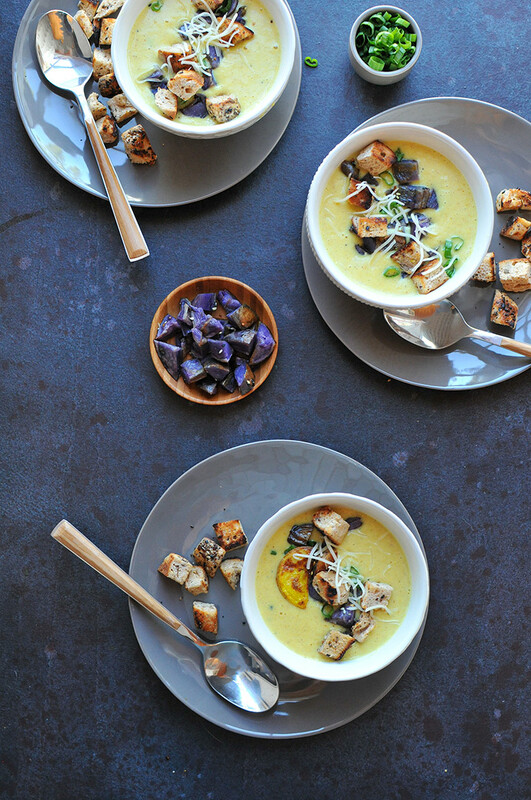 Serve soup hot with chopped purple potatoes, the toasted bagel cubes, and a sprinkle of green onions (optional).